The only time I have ever had an experience with hair extensions is from modeling in a fashion show where the hair stylist put clip-in extensions on all the models to create a really cool, huge braid. Other than that I never used hair extensions or false hair of any sort in my life just because I love my natural hair and never felt the reason to do anything different. Since I would never use extensions on a daily basis, I think it's great for the modeling aspect or creating really voluminous, mermaid tresses. I always admire watching hair tutorials on YouTube and trying them out on myself, but recently I have realized that so many of the girls are using hair extensions in the videos. Lush Hair Extensions (their Instagram is literally hair goals!) 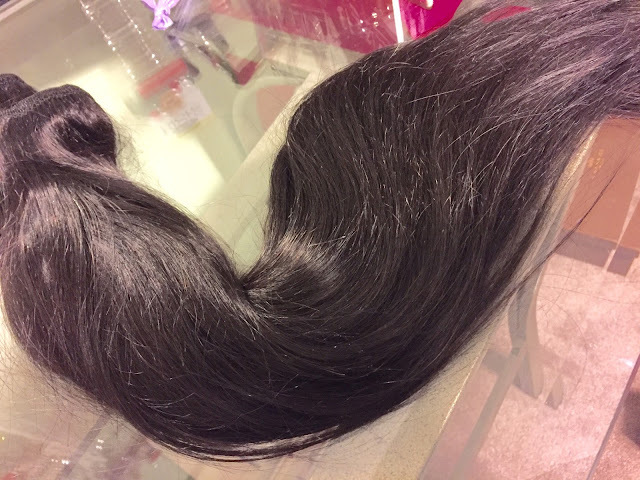 kindly gifted me an amazing set of 20" clip-in extensions in natural black. I was instantly impressed by the way the hair felt, it was just as soft as mine. They blended in perfectly with my natural hair color and highlights also. I see why people love them so much because of how much volume there is as soon as I clipped in a few wefts. It came with ten wefts which is more than enough to get super glam hair. The extensions can be curled and styled like normal since it is 100% remy human hair. It took me about ten minutes to clip in all the pieces and three minutes to clip them out after. The user friendliness has the be the best part! After....the extensions are clipped in. How cool! Loving the hair extensions on you.